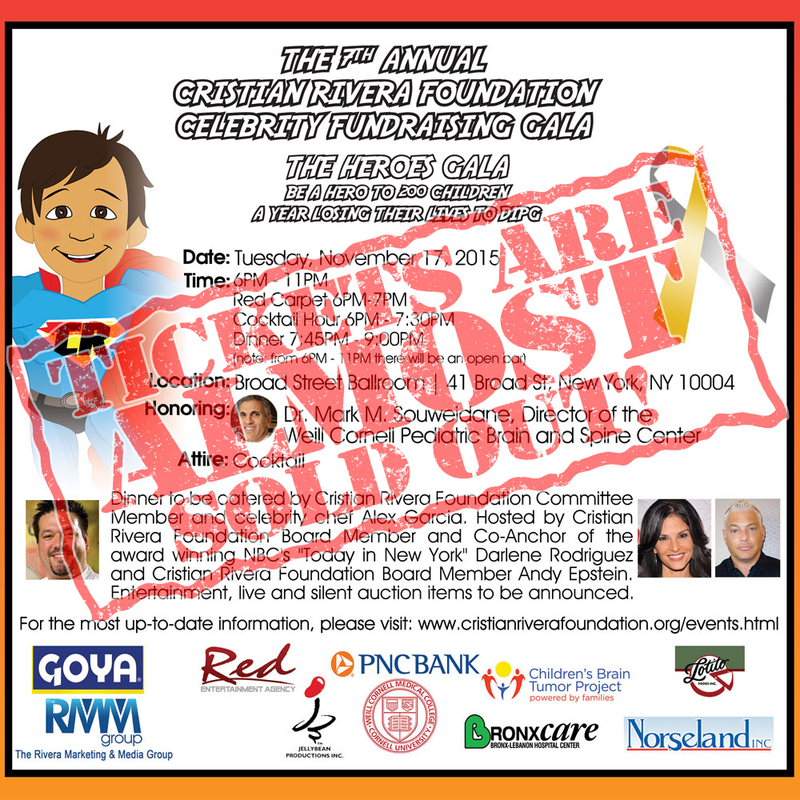 The Cristian Rivera Foundation has amazing news to share! This years’ Cristian Rivera Foundation’s Humanitarian Award recipient is Brandon Stanton. 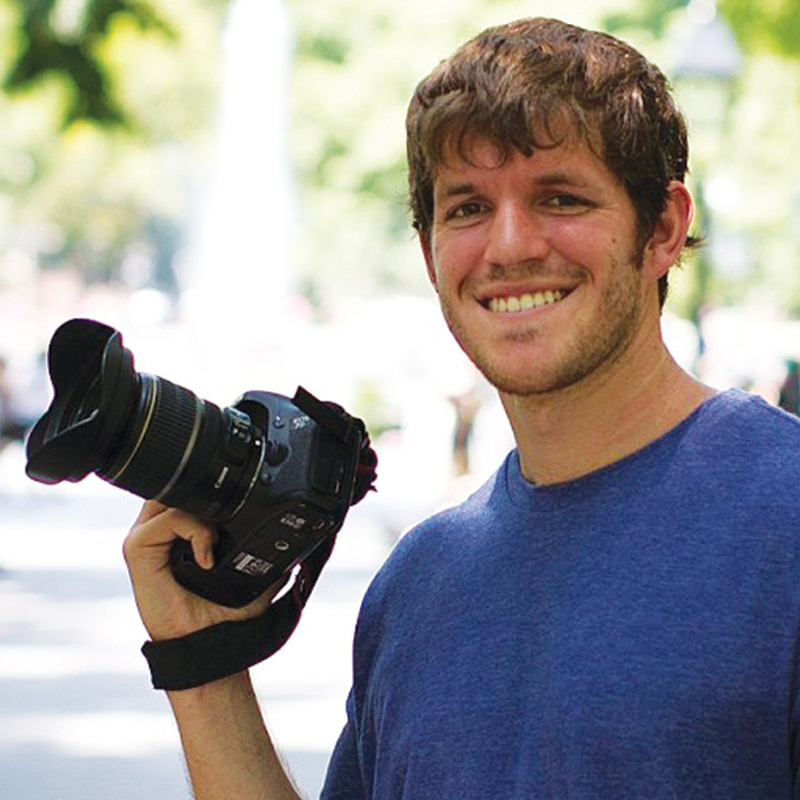 Brandon is the founder of the incredibly popular Humans of New York! Earlier this year, Brandon ran a story and a subsequent fundraising campaign to benefit Dr. Mark Souweidane. We were impressed with Brandon’s dedication to humanity. We are honored that Brandon accepted the award and we look forward to hearing him speak at the Gala. 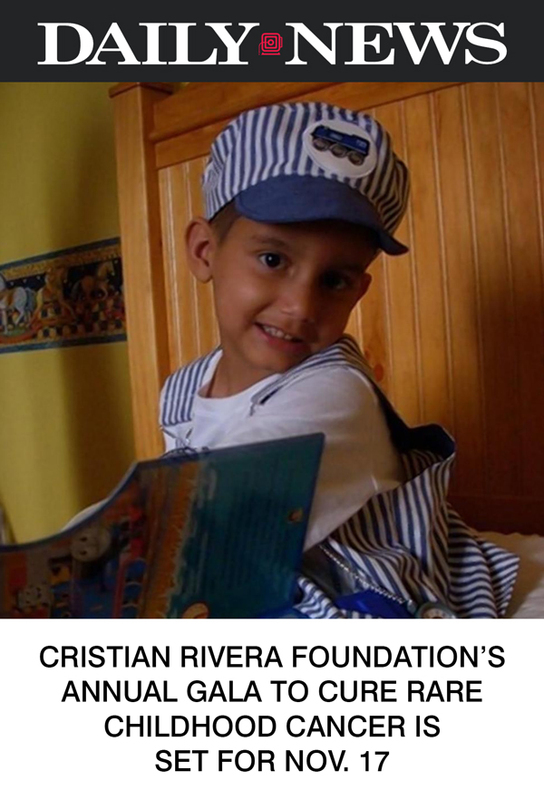 The mission of the Cristian Rivera Foundation is to help find the cure for the Pontine Glioma brain stem tumor. What is DIPG (Diffuse Intrinsic Pontine Glioma)? DIPG is a Rare, Inoperable Brain Stem Tumor that predominantly affects children between the ages of 2 and 10. Only 200-300 cases are discovered in the United States each year and because there is no cure, it’s young victims only have an average of 3-18 months to live, after they’ve been diagnosed. There are NO SURVIVORS. Who is The Cristian Rivera Foundation? tirelessly, in order to raise awareness and funds to one day put a STOP to this disease. The Cristian Rivera Foundation funds the work of Dr. Mark Souweidane of Weill Cornell Medical Center – Memorial Sloane Ketting Cancer Center and Dr. Oren Becher of Duke University. Both Doctors are conducting promising research and trails that have shown promising results. We are CLOSE to a CURE! Thank You again and may this be the year we say goodbye to DIPG, (Diffuse Intrinsic Pontine Glioma), FOREVER! Andy Epstein, Darlene Rodriguez and Craig Serra. at the Broad Street Ballroom. Pediatric cancer research got a major boost as The Cristian Rivera Foundation held its 4th Annual Celebrity Gala at the legendary Copacabana Supper Club and Event Space on Thursday, September 13. 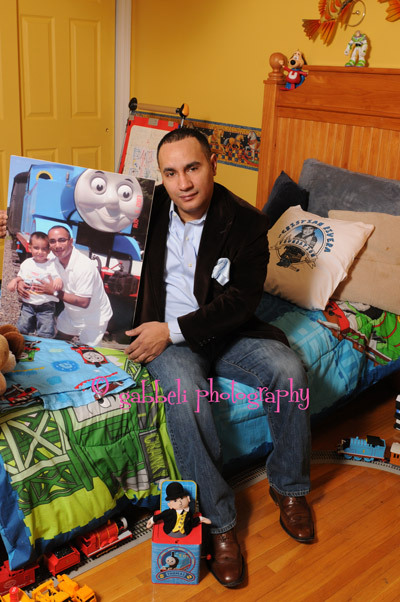 The event was held on what would have been Cristian’s 10th birthday, in the same location as the memorable fifth birthday his Mommy and Daddy, Jenelle Asencio and John “Gungie” Rivera, had for him before he passed away from DIPG. 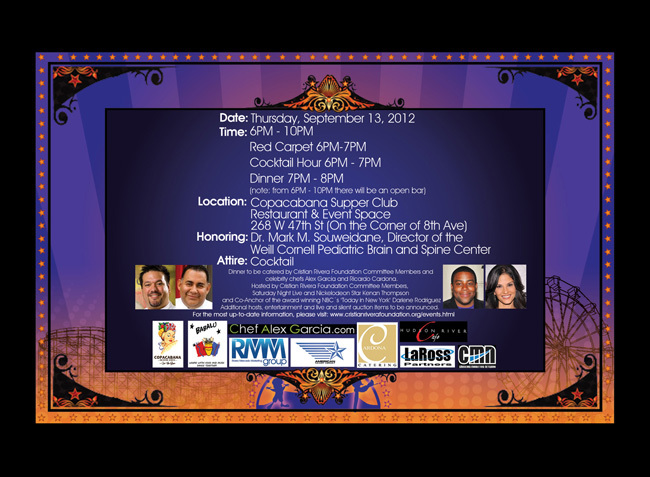 Hosted by Cristian Rivera Foundation Committee Members Saturday Night Live star Kenan Thompson and Today in New York co-anchor Darlene Rodriguez, the gala featured an exciting carnival theme, complete with acrobats, contortionists and other circus acts that wowed the crowd as they enjoyed dinner provided by Cristian Rivera Foundation Committee Members and Celebrity Chefs Alex Garcia and Ricardo Cardona. Cristian’s Mommy and Daddy, along with all the committee members in attendance that night, presented a check for $110,000 to Dr. Mark Souweidane of Memorial Sloan Kettering Cancer Center and also marked the start of a new relationship between the foundation and Dr. Oren Becher of Duke University with a donation of $20,000. 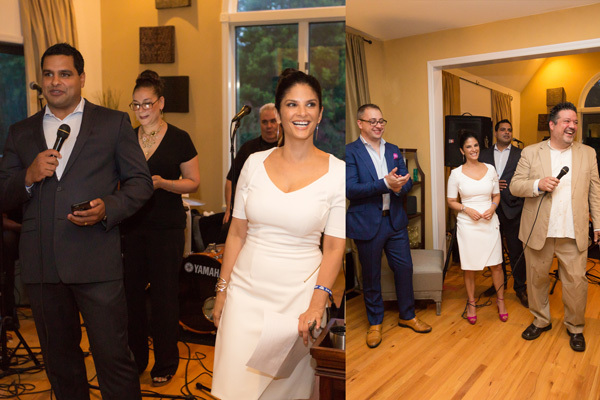 Not only were both doctors in attendance that night, but the Cristian Rivera Foundation was also proud to welcome the first patient in Dr. Souweidane’s clinical trial and her mother, who moved the crowd to tears as she shared the story of her daughter’s surgery and the continuing struggles with DIPG that followed. Making the night’s generous donations possible were philanthropists and charity supporters that included celebrities like Dangerous Minds co-star Renoly Santiago, Mob Wives star Drita Davanzo, and America’s Next Top Model Cycle 8 winner Jaslene Gonzalez, and high-profile Cristian Rivera Foundation Committee Members like Hot 97’s Funkmaster Flex; Real Housewives of New Jersey star Danielle Staub; former New York Knicks All-Star Anthony Mason; legendary DJ/producer John “Jellybean” Benitez; One Life to Live star Kamar de los Reyes; actor Modesto Lacen; founder of Teatro SEA Dr. Manuel A. Moran; and Roberto Clemente Jr.
Also making a special appearance were Cristian Rivera Foundation Committee Members including Aldo Marin; Andy Epstein; Dr. Ben Velazquez; Carlos Keyes; Carlos D. Nazario; Carlos R. Colon; David M. Garriga; Dennis Rodriguez; Dolores Catania; Elis Pacheco; Fred Garcia; Jeff Lavino; Jerry Chaparro; Jerry Salerno; Johnny Nunez; Karen Cerna; Katie De Florio; Kim Medina-Tibulac; Krystal Fessette; Mark Rosner; Matthew “Mateo” Rajkumar; Robert Vazquez; Solange Osorio; Steve Cox; Tony Ferrara; Vito Bruno; and William Padilla. Thursday, September 13, 2012 Are on Sale Now! Includes: Open Bar & Buffet. Access to all 3 floors including Rooftop. Includes: Open Bar & Buffet. Access to all 3 floors including Rooftop. Notable names from television, restaurants, radio and sports have been seen wearing the new Cristian Rivera Foundation bracelet, which debuted at the Third Annual Cristian Rivera Foundation Gala on Monday September 12. Inspired and designed by Cristian’s Mommy Jenelle Asencio, each brown beaded bracelet features the Cristian Rivera Foundation logo in your choice of a bronze or silver charm. 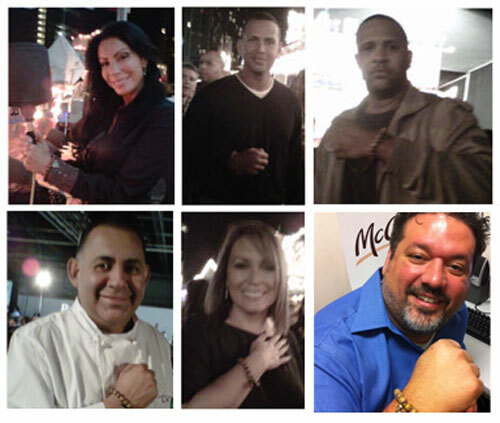 The bracelet received a great reception upon its debut and has already seen on the wrist of New York Yankee greats CC Sabathia and Alex Rodriguez, as well as Hot 97’s Angie Martinez, Danielle Staub of The Real Housewives of New Jersey and celebrity chefs Ricardo Cardona and Alex Garcia, both of whom are committee members of the Cristian Rivera Foundation. Visit http://cristianriverafoundation.org/shop.html to order yours today.